MINDZPEAK: Ohhh... What a Waste ! As most of my friends have classified me in the group of nocturnal animals, I was, as usual, seconding their views about me and fooling around while the rest of the neighborhood slept in peace. And before long, I was surfing the channels on the telly to find something worth watching till the time I dropped off too. And it was then, when I stumbled on to ‘MTV’. Since the time when I first came to know about it, ‘MTV’ was supposed to be ‘Music Television’. A channel, that was related to music of all sorts. But as I find it now, music is the last thing you would find being telecast on it. We are living in the times of reality tv. But what has reality tv got to do with ‘MTV’ is something I find hard to understand. Shouldn’t they be aired on channels made for all round entertainment ? Well, I guess I’m drifting away from the point I want to make here. And the point is that when I got to ‘MTV’ I found another of those reality shows. It’s called ‘The Fast & The Gorgeous’. I don’t know if you have heard of it. But I had seen a few minutes of it one or two times before. For those of you who are still unaware of the contents of ‘F&G’, I’ll just try to brief you about it. Well, they have assembled a group of (apparently gorgeous) girls from all over India (well, mostly from Delhi and Mumbai) and put them up together to compete with each other. They are given certain ‘tasks’ to perform through which they can ‘vote out’ one or two of the competitors each week. Ok. So that pretty much appears to be another normal reality show. A show where girls try their best to depict themselves are ‘commodities’ which would be the best bet to help to enhance ‘Force India’s market value. Probably that of ‘MTV’ too. As I stumbled upon this show, I just watched on to see what they had in store this time. And the ‘task’ in progress right then made me twist in my chair. I don’t know if you have ever experienced being twisted in the chair while relaxing in the short hours of the night after a yummy dinner. But if you have, you’ll understand just how it made me feel right then. They had coupled those ever so skimpily clad girls in teams of two. Each team had to take on another team in a very simple competition. According to which, one girl from each team would stand in between two poles, her hands tied to them, blindfolded, while the girl from the opposite team would try to hit her on the face from some distance. Each girl getting six attempts in a span of one minute. All very simple. But, what made me twist was the object which they had to throw at each other. It wasn’t a ball or a water balloon. (I guess a shoe would have been the best possible option here) But they were actually using ‘pizzas’ to throw at each other’s face. But there cannot be a comparison between a well trained shooter and some (apparently gorgeous) girls throwing pizzas at each other’s faces. And so, they picked up pizza after pizza and hurled them with all they had got. And with each miss, my heart bled. 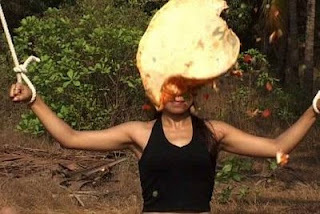 One after the other, those delicious discs of bread baked with all the yummy toppings, flew past each targeted girl. 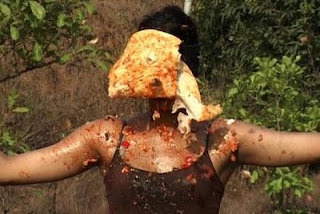 I felt as if even the pizzas didn’t approve of the idea of getting anywhere near those girls and dodged themselves past those make-up loaded faces. And eventually they kept ‘biting the dust’ all around the place. Ok. I admit treating myself to a wholesome and taste-buds-satisfying dinner a few hours earlier. But I’m not one with a heart of steel who wouldn’t think much of so many pizzas simply going to waste…. But, on a serious note, I wonder if such a ‘task’ was actually in any good sense. There are countless number of people in our own country who go to sleep every night with an empty stomach. And here we are, finding fun at game shows wasting so much of food just for nothing. I wonder if a particular Dr. Mallya who owns ‘Force India’ and ‘Kingfisher’ would give a thought to diverting just that bit of money used for the ‘pizza task’ for feeding those unprivileged people sleeping with empty stomachs. Dear Dr. Mallya, we are, no doubt, happy about you naming your team as ‘Force India’. And we won’t protest either if you decide to add some glamour to your team. You manage some big business in India as well as around the world. But surely you wouldn’t approve of even a part of that money being put to wasting of food ? I do hope that sooner than later, you would take notice of this and prevent any more wastage of food. If they need to hit each other in such reality game shows, let them find other options. But please spare the wastage of food at least. Makes me feel like suing the makers of this show! Kaddu : :D Me too. Too bad I'm unaware about the procedures of suing.